Want a new way to keep customers fully informed on their vehicle repair status? You just found one. Looking to boost your bottom line and make your shop more efficient? Let’s get started. Simplify rentals. Work smarter. ARMS® Automotive Suite. Enterprise Rent-A-Car created the ARMS® Automotive Suite to help collision repair centers focus on what they do best - getting customers back on the road. The Automated Rental Management System (ARMS) increases efficiency and enhances customer service by streamlining communications with insurance companies, customers and Enterprise. Enabling shops to send electronic rental reservations, vehicle status updates and automated text or email customer notifications. An internal reporting feature also helps forecast daily cycle time, providing month-to-month summaries, as well as market averages and insurance company cycle times by shop. “WITH ARMS® AUTOMOTIVE ALL STAKEHOLDERS ARE LOOKING AT THE SAME PIECE OF DATA IN ORDER TO GET THE DESIRED RESULTS. USING THE REPORTS WE WERE ABLE TO SHAVE ALMOST THREE DAYS OF CYCLE TIME OFF OUR NINE STORES, COLLECTIVELY. How does your shop's cycle time compare to industry averages? HAPPIER CUSTOMERS. RIGHT AT YOUR FINGERTIPS. ARMS® Automotive Customer Repair Status Notification offers a robust new tool for customer communications, helping you easily update customers with automated or customized e-mails and texts. Check under your own hood. ARMS® Automotive Reporting from Enterprise is a free tool you can use to maximize your shop's efficiency and grow your business. On average, shops that use the ARMS Reporting tool have shown a two-day reduction in rental cycle time. Measure individual shop performance—and the performance of the entire organization—by carrier. Increase customer satisfaction. Decrease wait time. ARMS® Automotive Suite allows your shop to send rental reservations to a local Enterprise branch electronically. So you can get to work sooner and your customers can get back on the road faster. What has changed about ARMS® Automotive? The ARMS Automotive application now offers the capability to automatically update your customers on their repair status with quick and easy e-mail and text messages. Not all of my customers rent a car, so how does this benefit those that do not? Our technology allows body shops to view all estimates and update all repairs, not just those that have an Enterprise rental car. Why is Enterprise adding customer notification? JD Power and Associates recently published a report* that shows customers who are proactively kept informed of their repair status have higher customer satisfaction scores. Repair shops have known this for some time and asked for this product. Since most are already using ARMS Automotive to send updates to insurers and to get free cycle time reporting, Customer Repair Status Notification made perfect sense. Needless to say, we all want to make the customer's experience a positive one. How often will my customers receive updates? That's completely up to you and your customers. You can send as few or as many manual or automated text/email updates as you like. Of course, you'll always want to obtain customer consent prior to initiating the messages. Our customizable system allows you to inform the customer throughout the repair process with messages that detail the completion percentage of the customer's repair; details of which department the customer's vehicle is currently in; and most importantly, updates on when the customer will be able to get his or her vehicle back. You can set the messages to be automatically sent as often as you want. Will this replace any need to call customers? It certainly can, but the choice is up to you. The automatic notification process removes any need for you to update customers throughout the normal progression of their repair. The system can also notify customers about more high-visibility issues, such as delays to the repair promise date. However, it may be appropriate to give issues such as these, more personal attention.  What kinds of messages can I send? 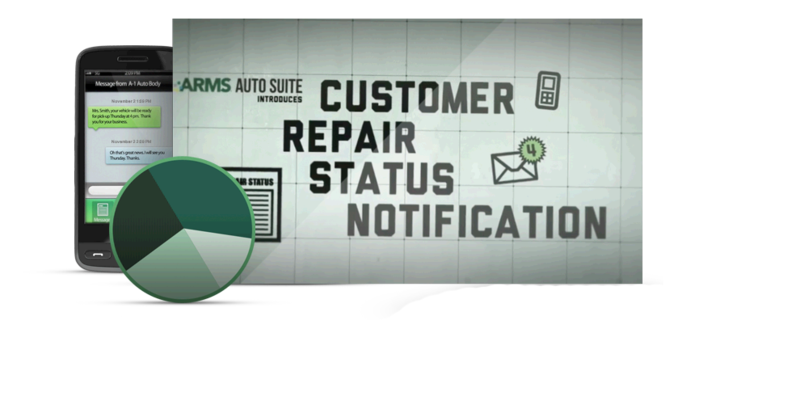 The ARMS Automotive Customer Repair Status Notification program comes with a fully customizable suite of message templates for each of the status updates you wish to send over the course of a repair. These message templates can include dynamic information such as the customer's vehicle information or completion date, and you can adjust the exact wording of the messages however you deem appropriate. In addition, Customer Repair Status Notification will enable you to send the customer an “instant” text message that can be typed directly into the ARMS vehicle detail interface, allowing you direct, instant contact with the customer. What happens when a customer replies to the message? When a reply is received from the vehicle owner, the shop user will be notified via email and a text "Messaging Icon" will appear next to that repair file in the ARMS Auto Vehicle list. Further, all text communications are stored in the online ARMS Auto "Communication Log" for that rental/repair. Is any installation needed at the shop level? Where do non-rental repair files come from? No additional installation is required by the shop to use these features. 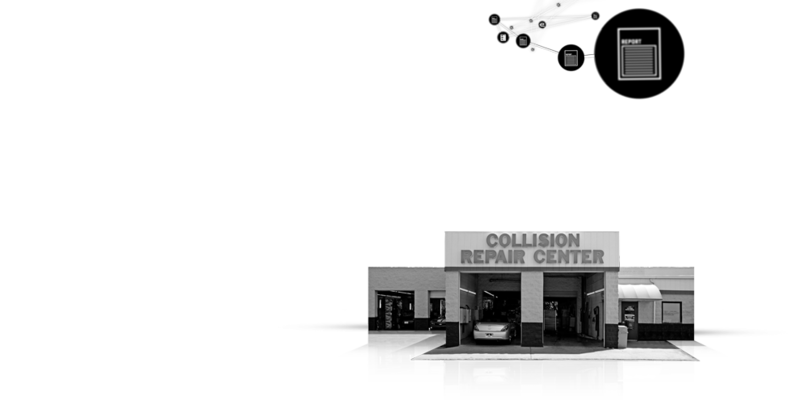 The same ARMS Data Manager that shops are already using for ARMS Auto electronic updates can also be used to populate the shop's "ALL REPAIRS" list. ARMS Automotive Customer Repair Status Notifications can only improve your relationship with customers. It simply provides you and your customers another method of communication that is fast and doesn't require you to both be available at the same time. In fact, the JD Power & Associates study* shows that repair status updates by e-mail and text message are now the chosen methods of communication for people of all ages, receiving the highest CSI scores. Most importantly, these methods allow for customer response. If the customer replies to your text (either automatic or instant), that reply will be sent to your e-mail and entered in a communication log that is visible from the application. You won't have to worry about leaving customers a voicemail, only to have them wait on hold when they call back. You will be able to have an ongoing dialogue with your customers that works with both of your schedules and availability. Is my customer privacy protected? All information gathered through the ARMS Automotive Suite of products is kept confidential and used for the limited purpose of rental management. The ARMS Automotive Application Data Privacy Guarantee is part of our value proposition and reaffirms our commitment to the privacy of our mutual customers. What if a customer doesn't want to be a part of the program? The ability to receive automatic updates on their repair status will be of great interest to many of your customers. However, everyone is different, and ARMS Automotive allows for those differences with our customization process. The shop should obtain customer consent prior to initiating program messages, and then select which customer contact method is preferable (text or e-mail), or select none in the event the customer does not wish to participate. And if the customer decides he or she doesn't want updates in the middle of the process, they can simply reply STOP to one of the automatic messages or click on an "unsubscribe" link via e-mail to be automatically withdrawn from the program. If you are already signed up for ARMS Automotive, simply click here to begin to configure Status Notifications for your body shop from your shop's computer system. If you are not already an ARMS Automotive customer, click here to sign up now. 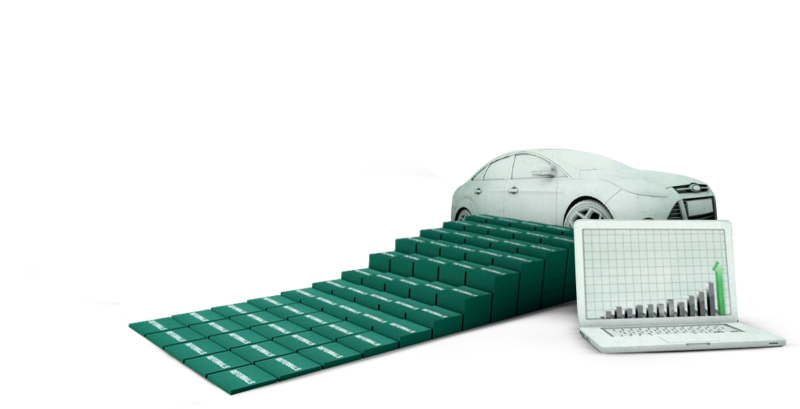 What is ARMS® Automotive Reporting? The ARMS Automotive Suite contains a series of reports available for viewing or downloading from the Enterprise ARMS Automotive site (armsauto.com). The reports contain carrier-specific rental length and labor hour information by rental and by carrier. What are the available reports? 1) ARMS Auto Closed Ticket Summary provides 3-plus years of historical shop data broken down by insurance company. 2) Current Month - ARMS Auto Closed Ticket Summary provides shop data broken down by insurance company and is updated on a daily basis. 3) Body Shop Forecast Report takes the closed and current open rentals that have an estimated completion date populated by the repair shop and combines the totals to give an estimated LOR. How do I access ARMS Automotive reporting? As part of the ARMS Automotive Suite Of Products, the reporting feature is available at www.armsauto.com. When a shop signs up for the ARMS Data Manager, they will have a reports tab enabled and can access their shop’s reports. How are Labor Hours populated? The labor hours come directly from the shop’s estimating system through our partners at CynCast. The ARMS Data Manager works behind the scenes to look for a match between the shop estimate and the Enterprise renter. When the match is achieved, labor hours are sent to Enterprise and populated into the ARMS Automotive application. Note that some insurance companies or estimating companies may also be providing labor hours that can populate the reports. Why do some of my repairs not show any Labor Hours? Sometimes the person renting the vehicle is different from the person that dropped off the vehicle and had the estimate written. This and other name situations can cause discrepancies and not allow a match of the shop’s estimate to the renter’s name. There is, however, a field within the ARMS Automotive application where a shop can place the last 6 numbers of the VIN number to help the matching process. How is the Market Average LOR calculated? The market is defined as the Enterprise operating group. The shops within each group and the rentals that are billed to insurance companies define the Market Average LOR. For more details on your geographical area for the market average, please contact your local Enterprise representative. The reports were created by input from your fellow repair shops that wanted the same information that insurance companies had. This information will help your shop prepare in advance for your meeting with insurers. Use this information to validate that your length of rental is solid, to achieve more business and/or enhance your cycle time. Many shops are using these tools to try and secure more or new DRP business. Why do Total Losses and vehicles I did not repair show up on my reports? Anytime a renter or insurer informs Enterprise a repair is being done at a shop, the Enterprise employee will “source” the rental to your shop. This is how it shows in ARMS Automotive when you view your vehicle list. By simply using the drop-down menu in ARMS Automotive, a shop can select options such as “Vehicle is a total loss” or “no record of this customer.” This will remove the specific rental from your updates list or from reporting. How do I get the details of each rental? The details for each rental are accessed by clicking the blue link in the report and then the customer's name. I own more than one shop, is there an MSO view available? Yes, MSO views are available. Is my information shared with the insurance companies? The information contained within the ARMS Automotive application is for your viewing only. Insurance companies do have specific information for your shop as it pertains to the mutual customer. What is the cost for receiving the reporting? There is no cost to the shop for receiving ARMS Automotive Reporting. It’s a valuable free business resource from Enterprise. Simply click here to sign up now. How do I get the Reservation feature enabled in ARMS® Automotive? Your local branch provides access, usually within 24 hours. Why do I need to fill out information on the reservation form? The information on the reservation form is the same information requested from customers. By providing all of this information ahead of time, Enterprise can reduce your customers’ wait time at your local branch with a “Priority Pass” upgrade. What if I don’t have all of the information requested on the form? You can reduce your customers’ wait time at the rental office by filling out as much information as possible. This allows the local Enterprise branch to begin preparing their rental before they’ve even arrived. If I am an MSO, can I have one login screen for all my locations? Of course. Enterprise has created a login specifically designed to allow MSO’s to view all of their locations at once. It can also be used for other products in the ARMS® Automotive Suite, including Reporting and Customer Repair Status Notification which allows you to send text and email repair updates to your customers. Have a question? Simply send us a contact & support request by filling out the information below and a representative will contact you shortly. Or, feel free to contact your local Enterprise sales representative for more information. We're always happy to help. Thank you for your inquiry. An Enterprise representative will be in touch with you shortly. Reporting, Status Notifications and/or Rental Reservations for your body shop. and we'll contact you shortly to get you set up.